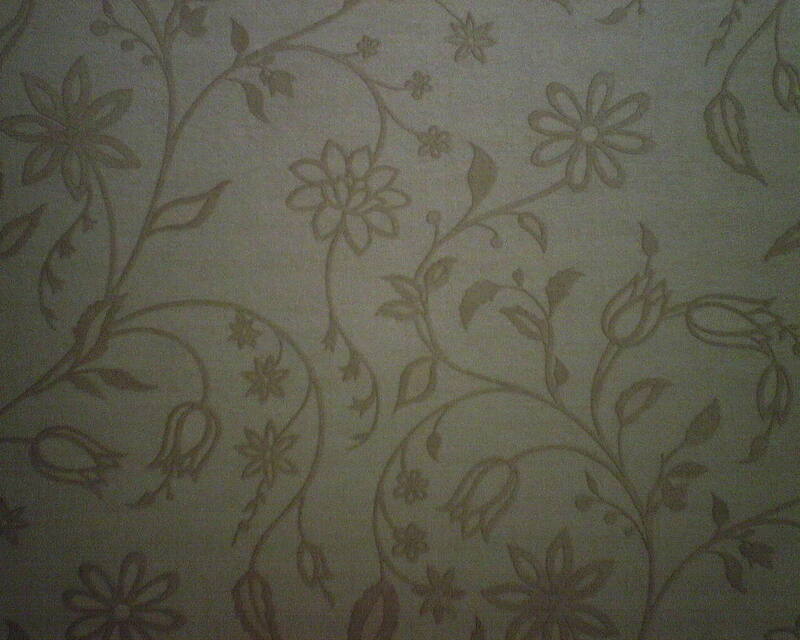 Wallpaper In This 1/2″ Wide Space? – You BET I Can! 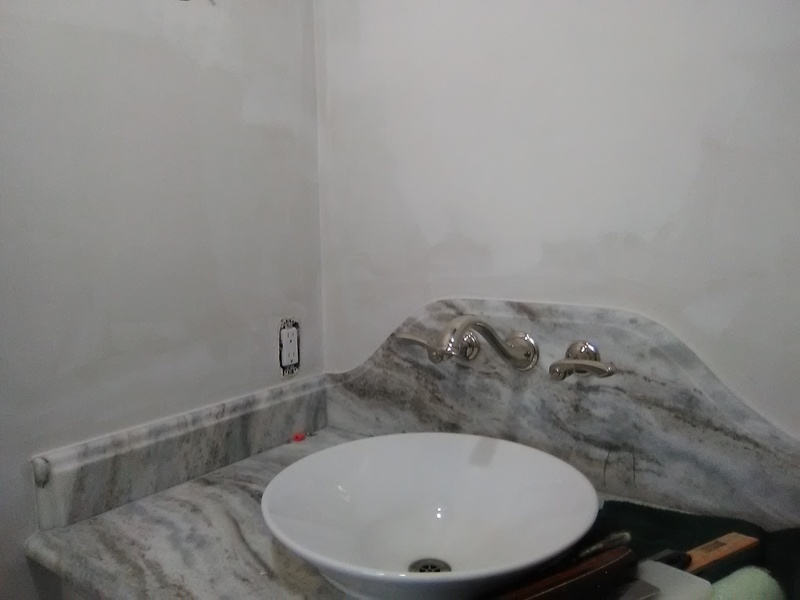 Well, somebody forgot to tell the contractor to push the vanity all the way against the wall … Resulting in this 1/2″ wide gap between the countertop and the wall. 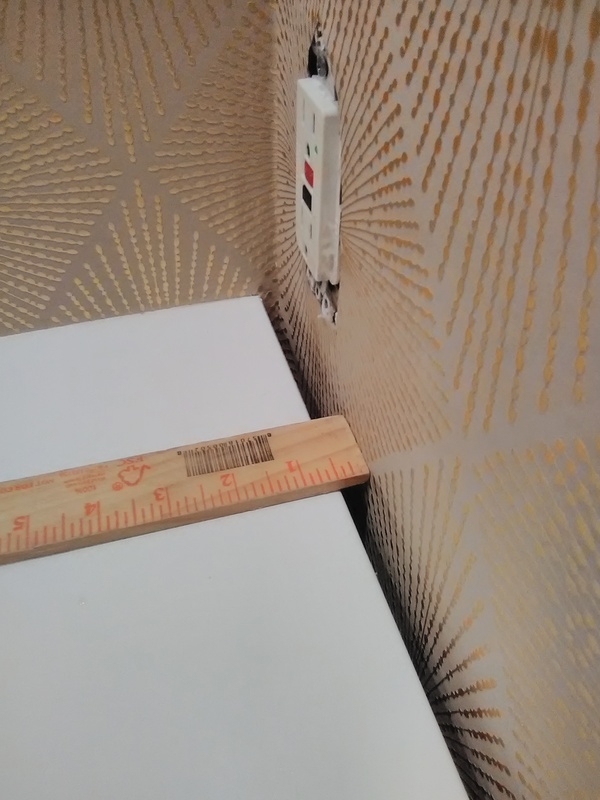 With some careful folding, unbooking, and the use of a wooden yardstick to both pull the pasted paper away from the wall, and then smooth it against the wall as needed, I was able to get a contiguous strip of paper into this narrow space. 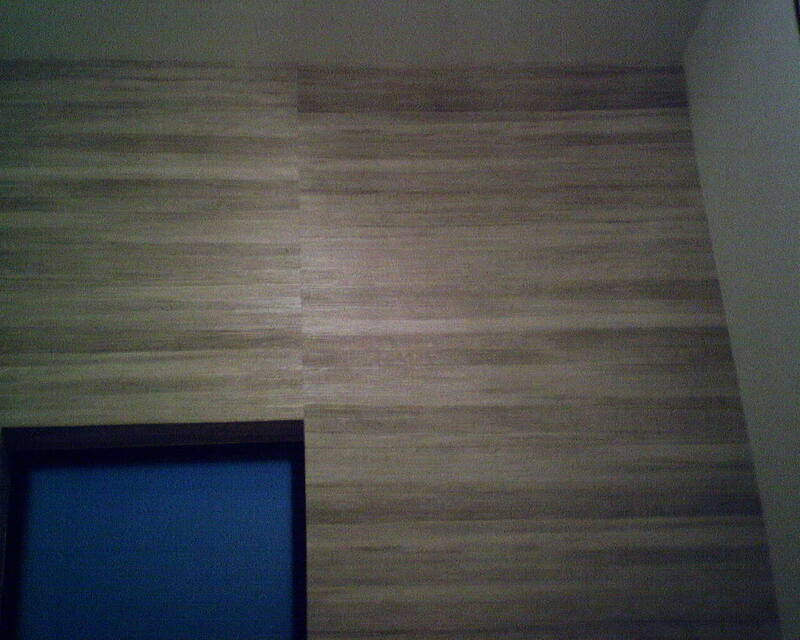 These powder room walls were textured in a heavy “Tuscan” finish. 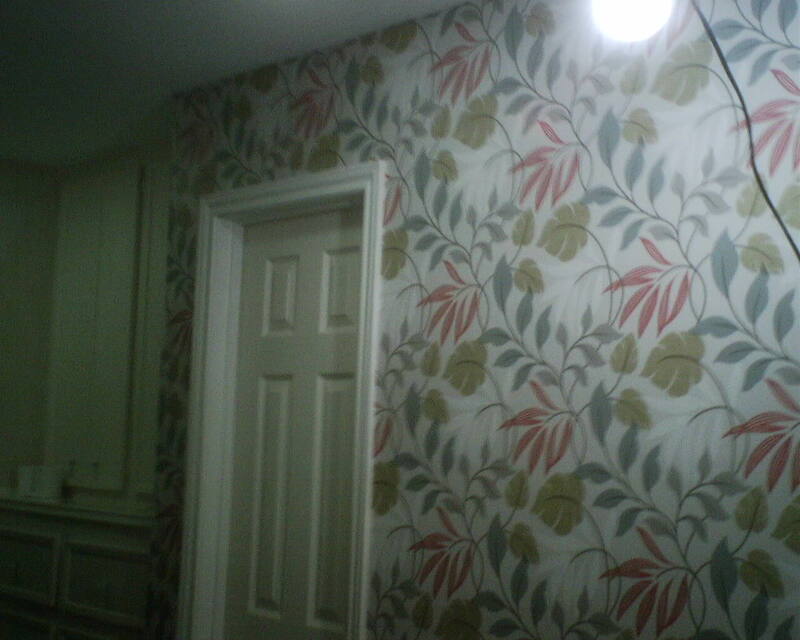 The homeowner asked her contractor to smooth the walls, so they would look good under the new wallpaper. The guys did a good job in most areas. But, as you see here, they fell short in others. 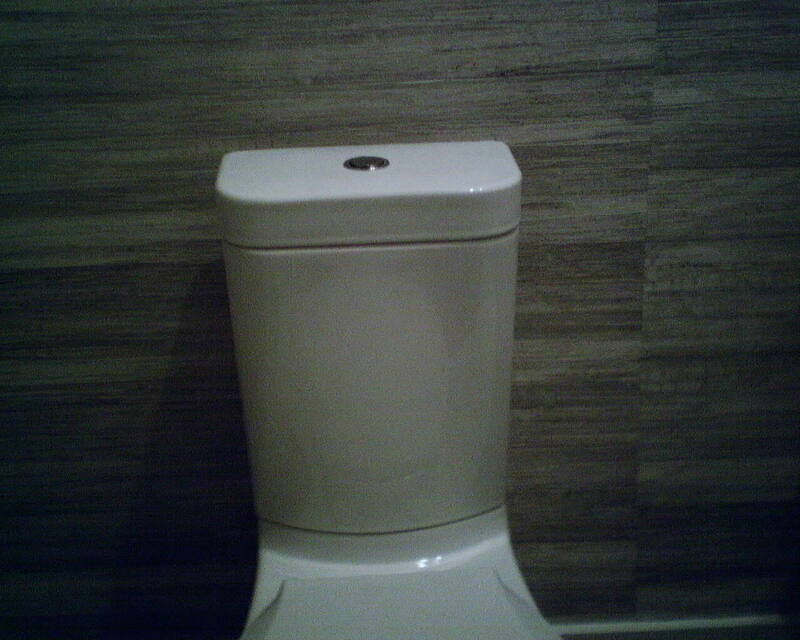 First of all, it’s simple to remove a toilet paper holder. Why try to work around it, and get smoothing compound slopped all over it? 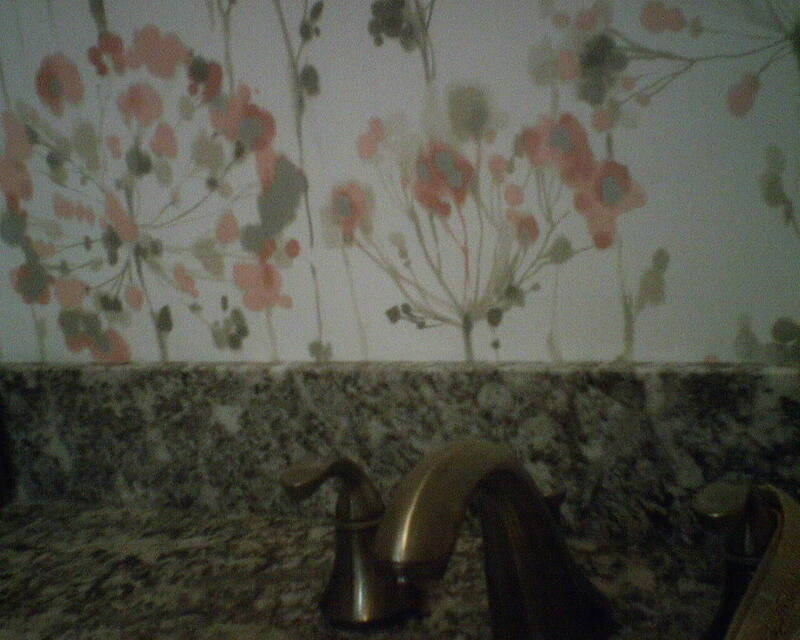 In the middle picture, this is a shot of the vanity backsplash. 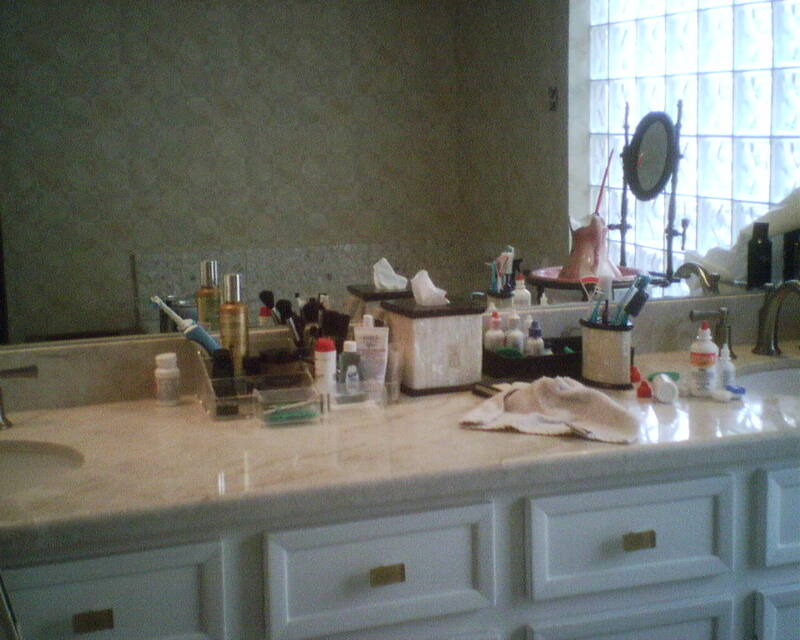 The smoothing compound falls short of the stone countertop. 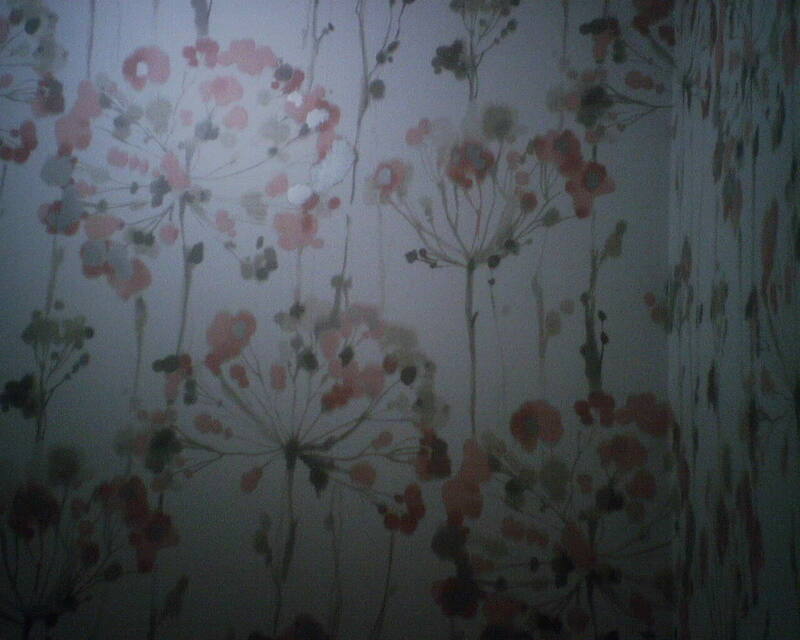 Since the wallpaper will end here, it needs a solid surface to grip ahold of. 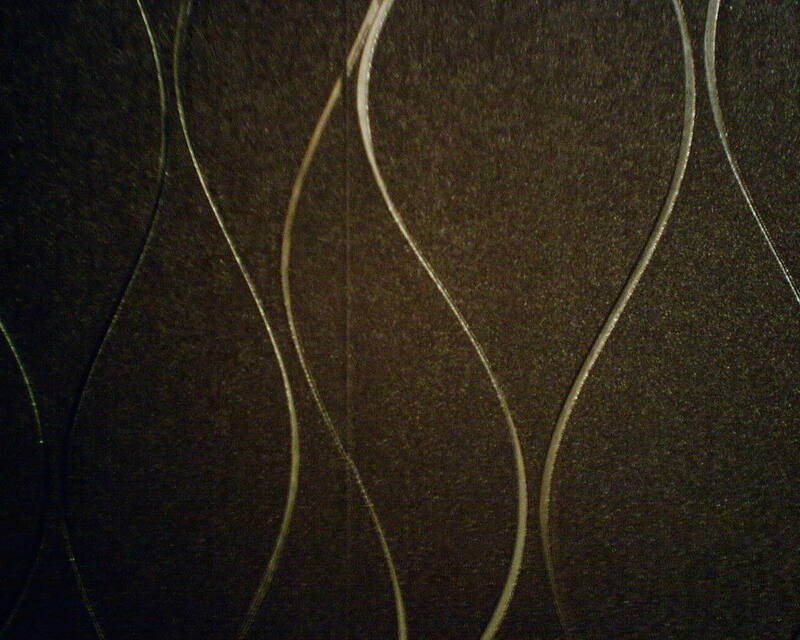 This gap between the smoothing compound and the stone will allow the wallpaper to gape open and curl away from the wall. 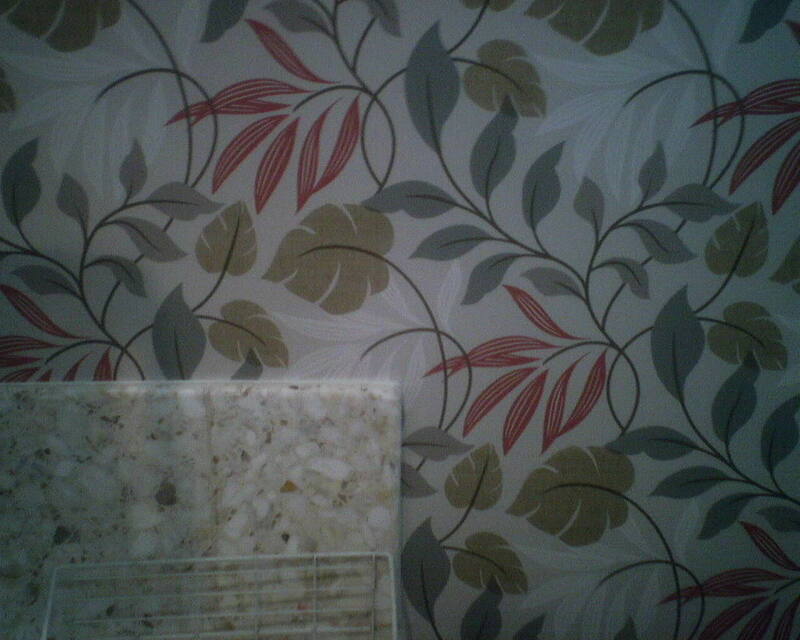 The third photo just shows careless work. Not horrible, but they could have done better. 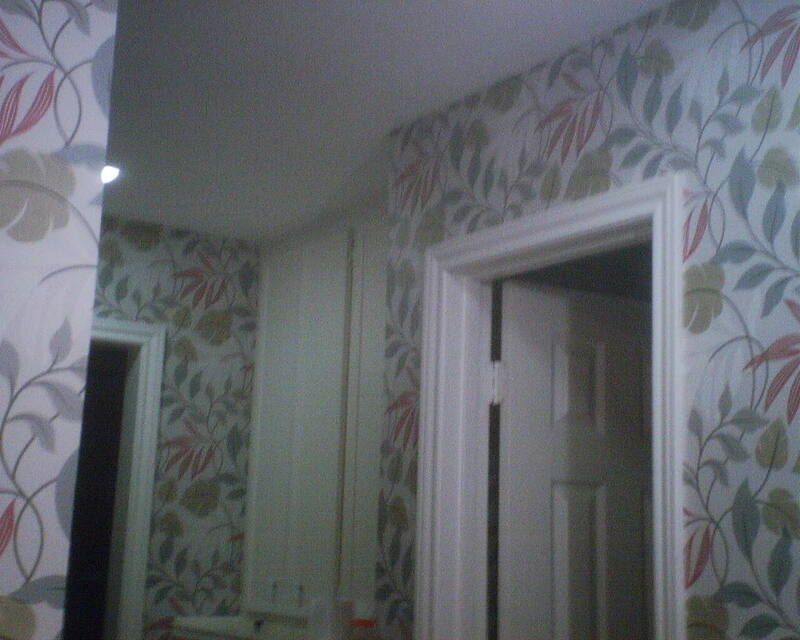 In all these areas, and others, I was able to do touch ups, so when the wallpaper goes up tomorrow it will have a smooth, intact surface to adhere to. 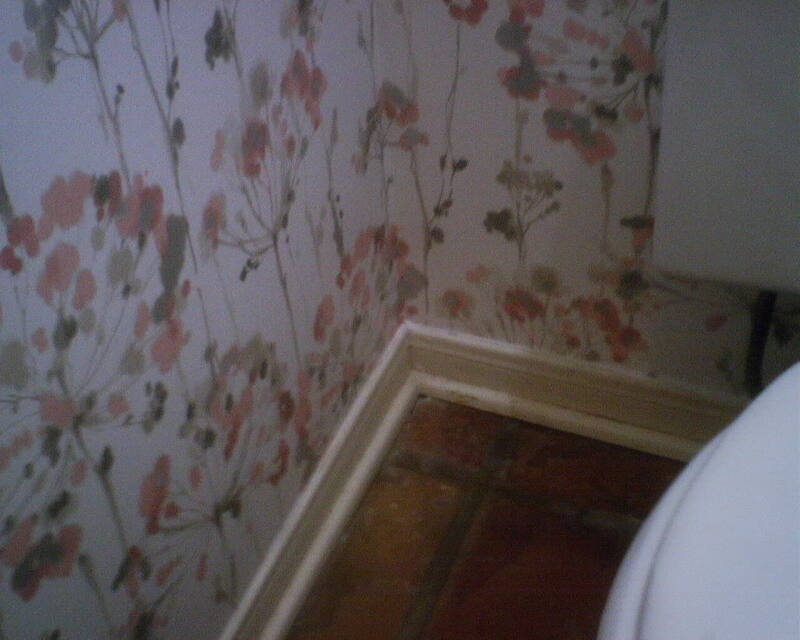 The sad part is, the homeowner paid the contractors to do this work, but now is paying me to finish the job. All this mess is hard for me to work around. 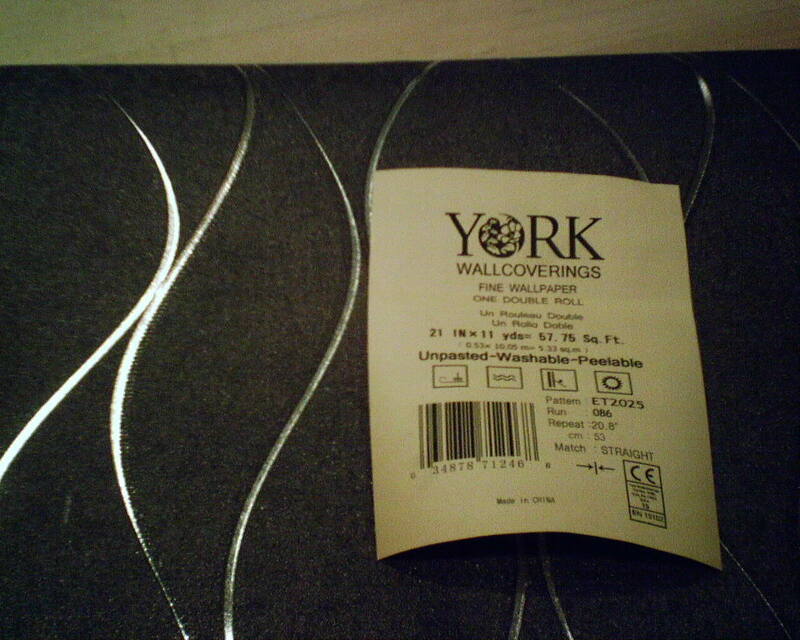 And since I often need to sand, even if I cover these items with plastic, they are likely to get a little dusty. 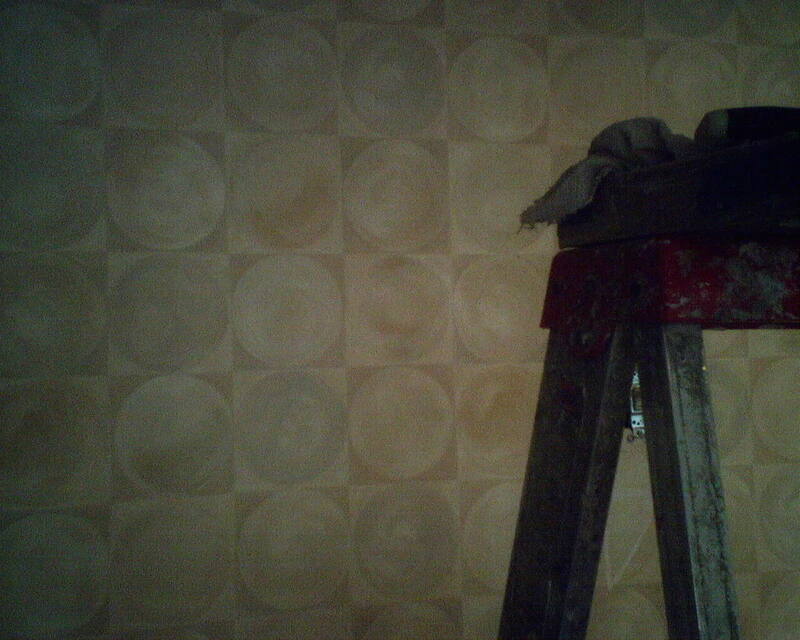 And they’ll need to be protected from splatters from the wallpaper primer. 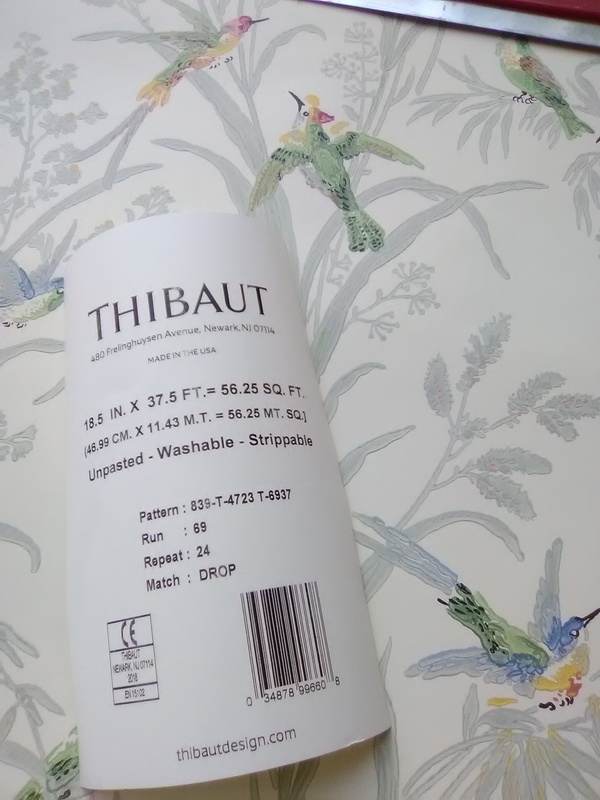 Sometimes I’ll move things out of the way, and then you never know where they will end up – under the vanity, on the bedroom floor, on the dining room table, in the bathtub – anywhere I can find a surface to set them on. 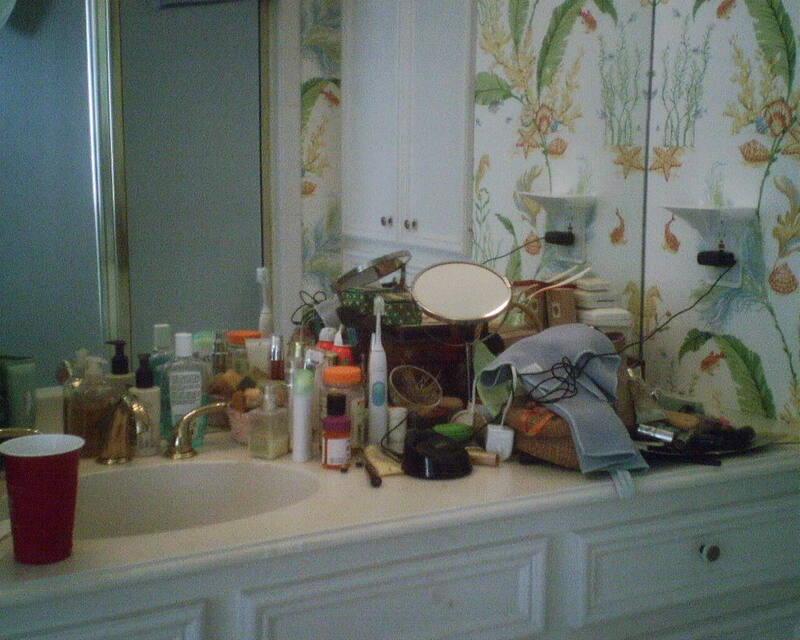 That gets them out of my way and keeps them clean, but it puts the homeowners on a search mission later, and they’ll have to try to put everything back the way they had it in the beginning. 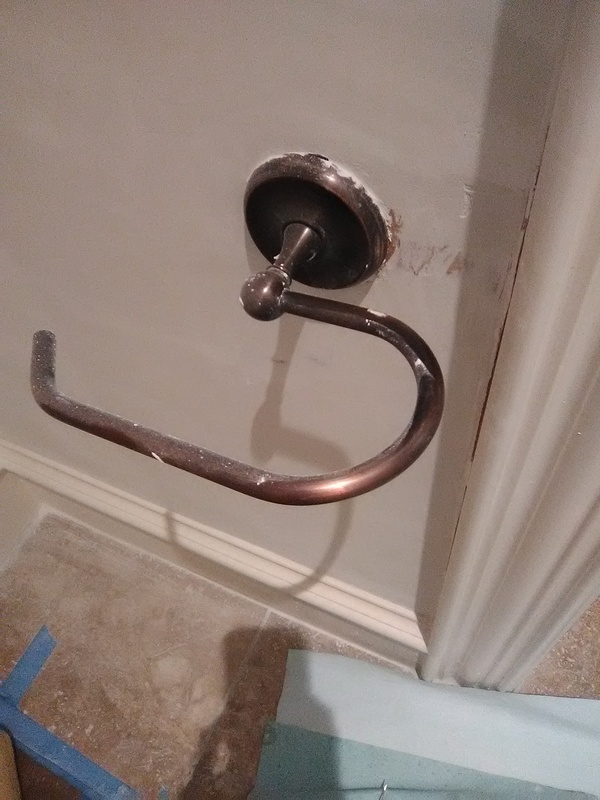 Best for the homeowner to take these things out of the room herself, and stash them where she can find them when the wallpaper job is finished. 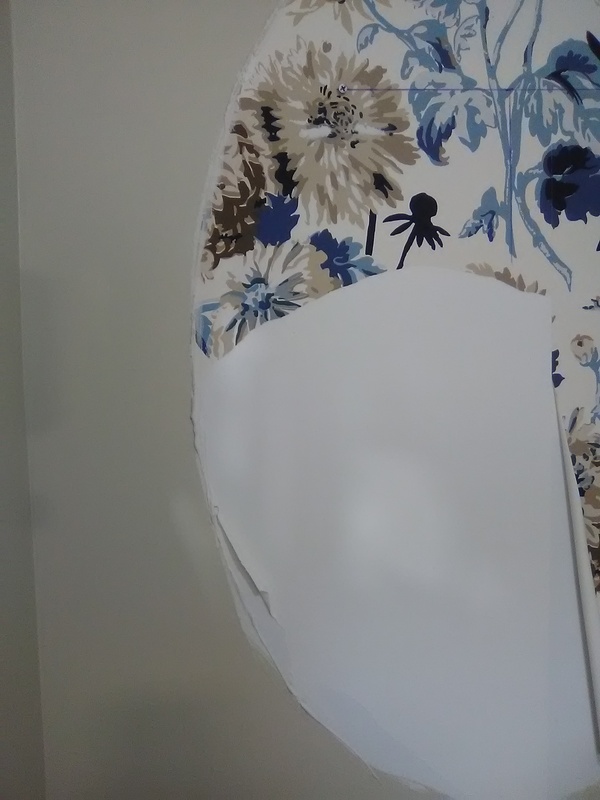 The existing wallpaper’s sphere pattern was easy to live with, and it went very nicely with the ’80’s era terrazzo floors. But the lady of the house was ready for an update. The new grey quartz countertop started it off, and it goes very nicely with the terrazzo. 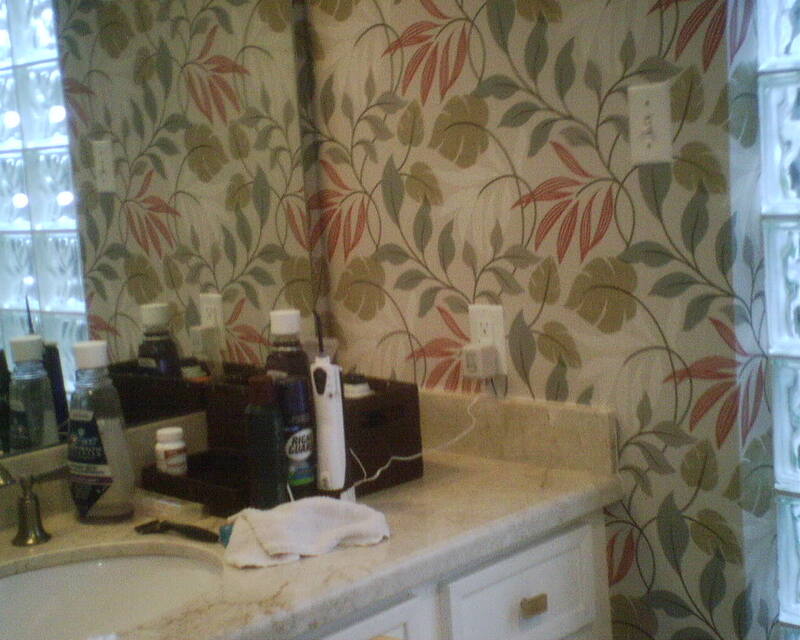 Next, this wallpaper pattern pulled everything together … It combines the greys and tans of the countertop and floor, and adds some jolts of strong brown, and then just enough bright magenta to keep everything fun. 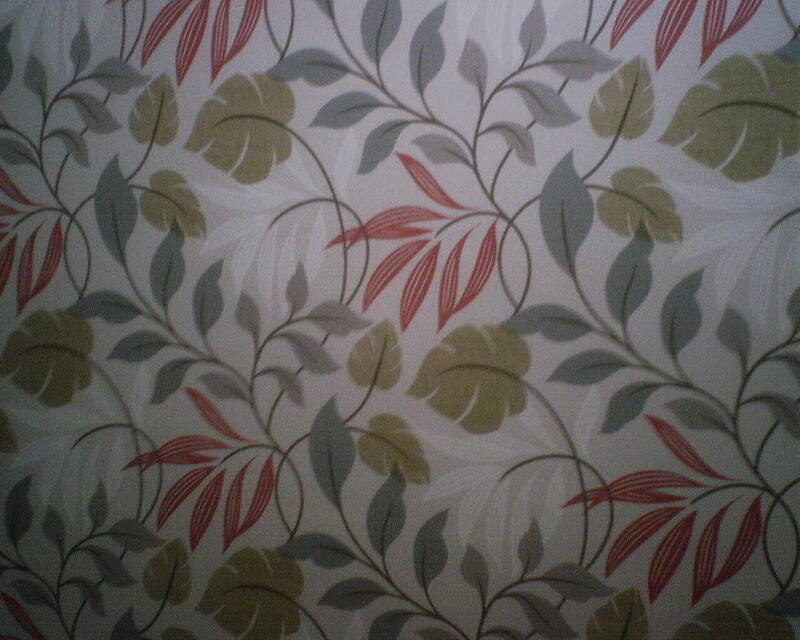 The foliage-inspired pattern has swingy movement and a youthful feel. The scale is perfect for this large, open master bathroom, in a home in the Fondren Southwest neighborhood of Houston. 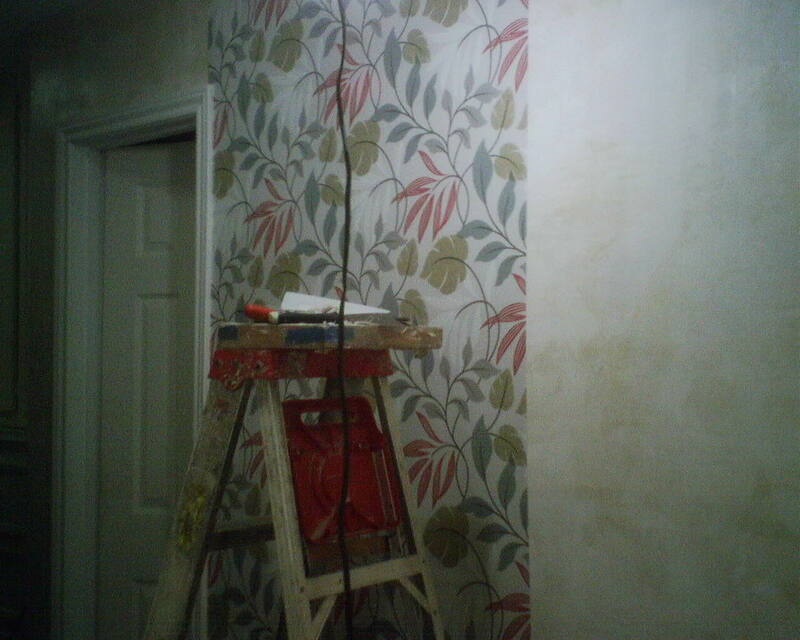 I do a lot of skim-floating to smooth textured walls, so the wallpaper will be bump-free and have a smooth surface to adhere to. 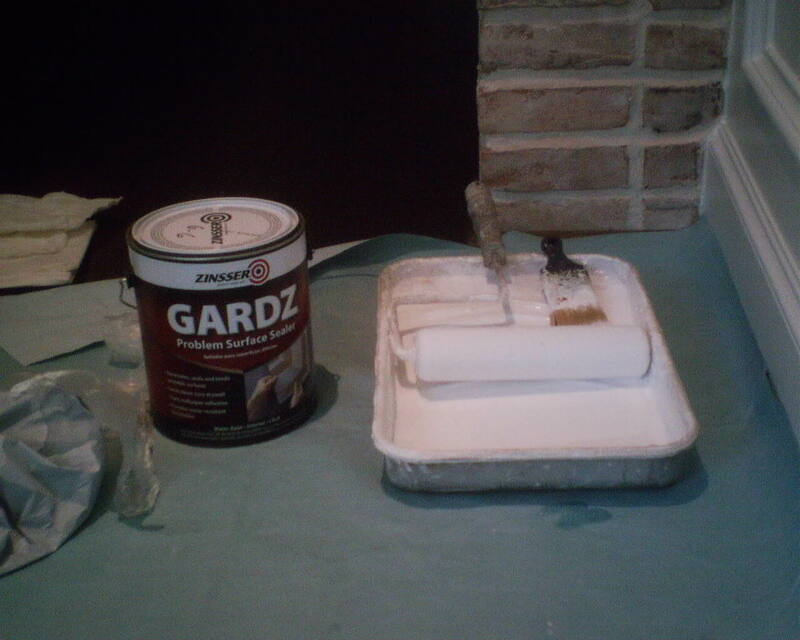 The penetrating sealing primer I like for this is Gardz, because it soaks in, dries hard, and binds the surface together. The downside is, it’s thin like water, and splashes and runs like crazy. There are tricks, like using a micro fiber roller, rolling in an upward direction, using light pressure on the roller, and paying attention to what you’re doing. 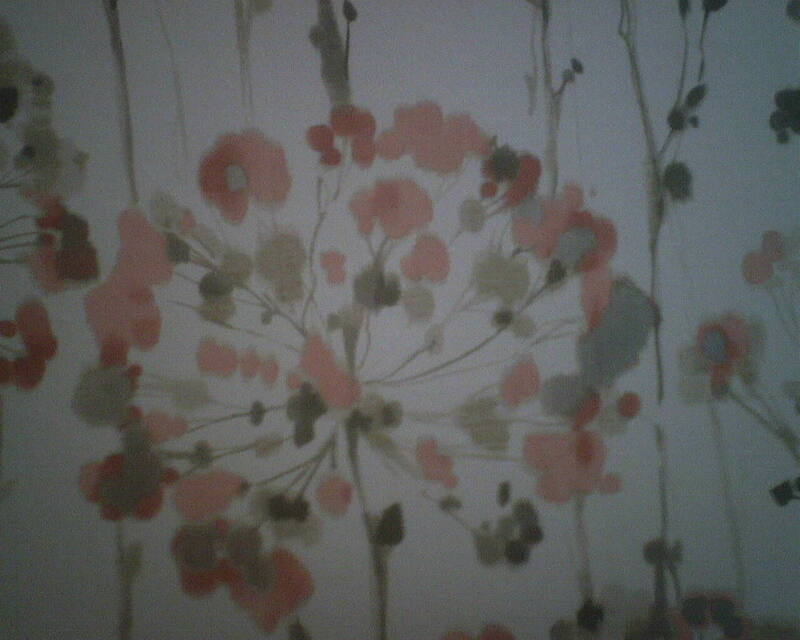 Still, splatters and drips will happen. 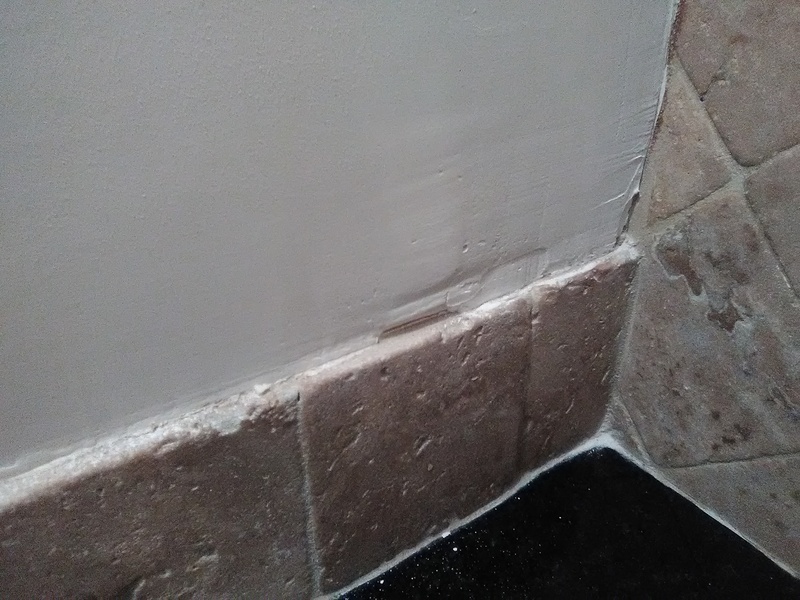 And they can happen with other primers, too, as well as with paint or any other product you are rolling or brushing on a wall. 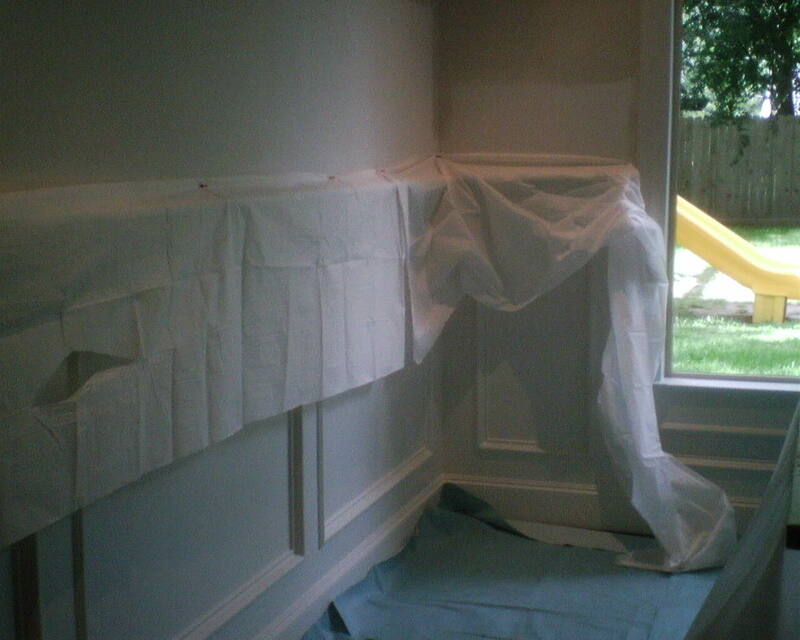 Most painters use a dropcloth to cover the floor. But I can’t stand the tiny “speckles” that fly off a roller and land on the shoe mold, baseboard, chair rail, or backsplash. 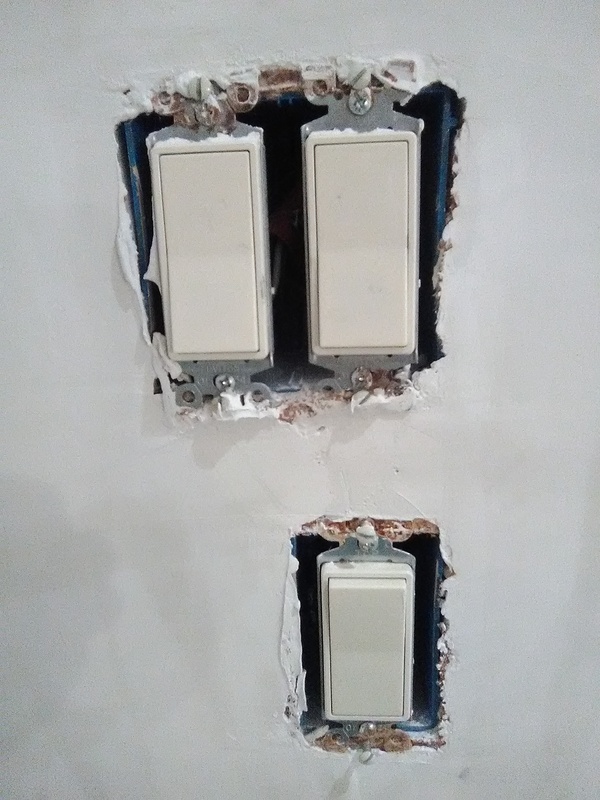 Many people wouldn’t even notice them, but I do, and I think the homeowner deserves better. 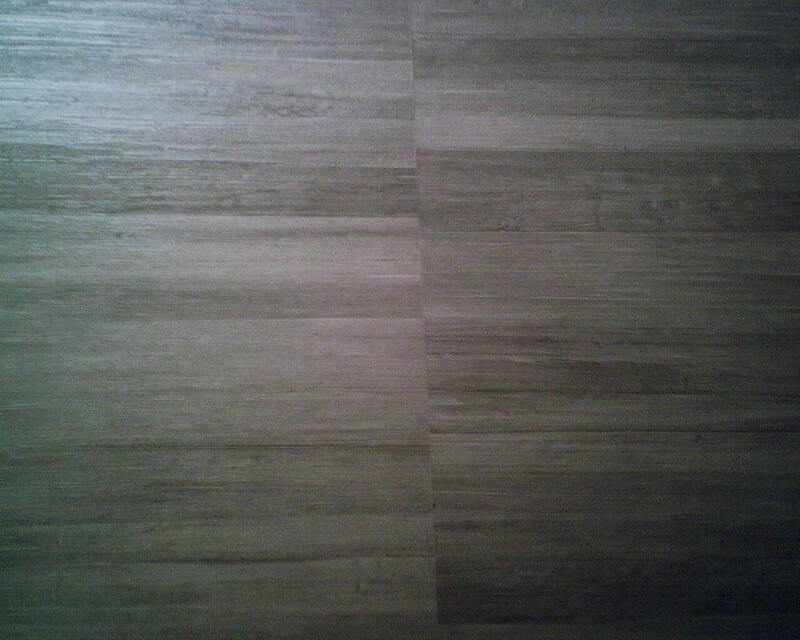 So I protect the homeowner’s floors and countertops as you see in the 2nd photo. 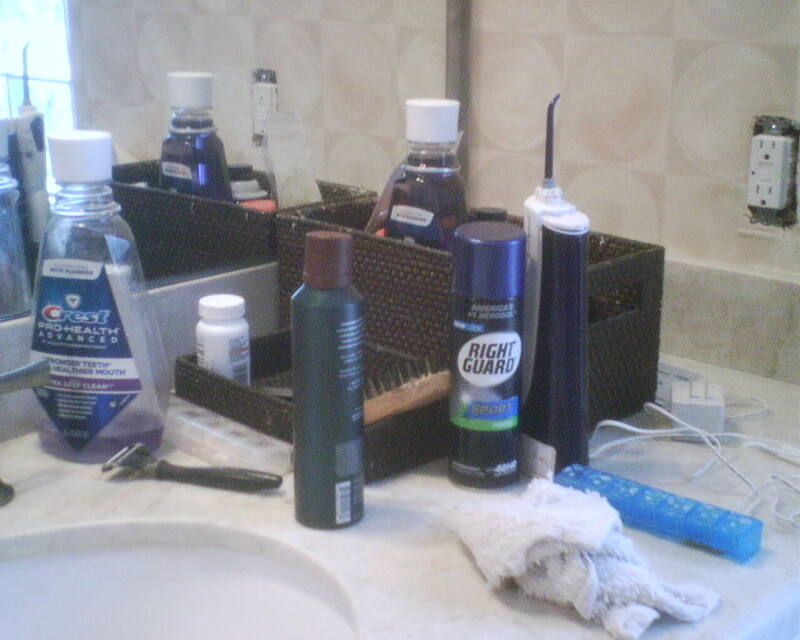 I put dropcloths down on the floor or counter. 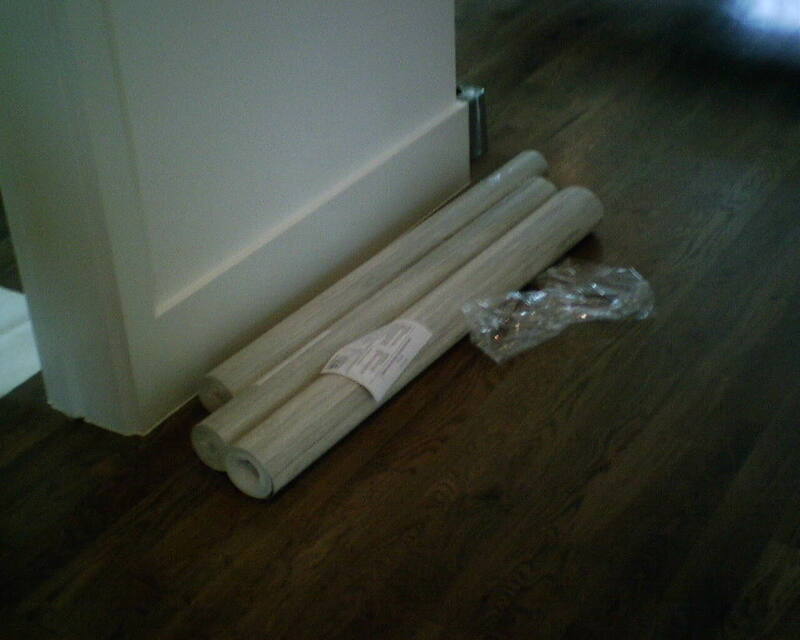 Then I cover the baseboards or chair rail or backsplash with an additional dropcloth, this time a thin flexible plastic-backed paper material. 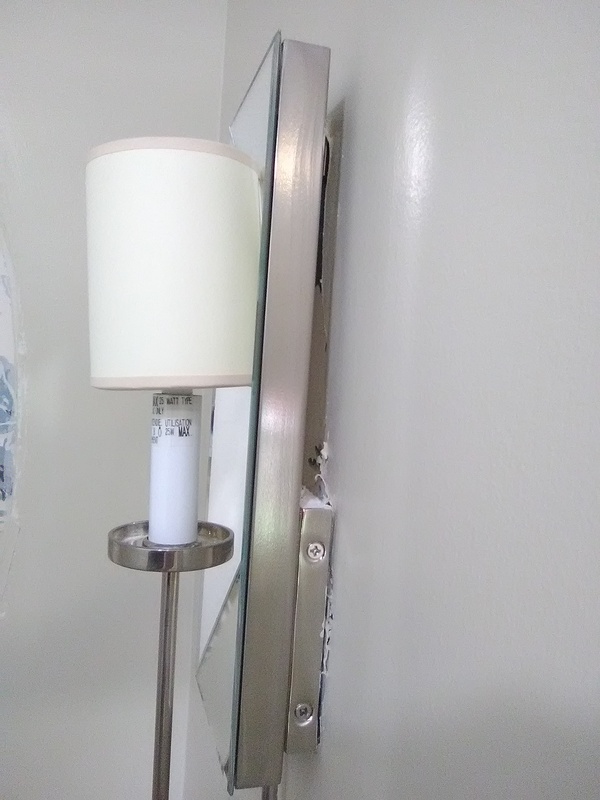 I use push-pins to hold it tightly against the wall, to catch any and all splatters and drips. It takes more time and it increases my material costs, but it sure is a better way to treat the client’s home. 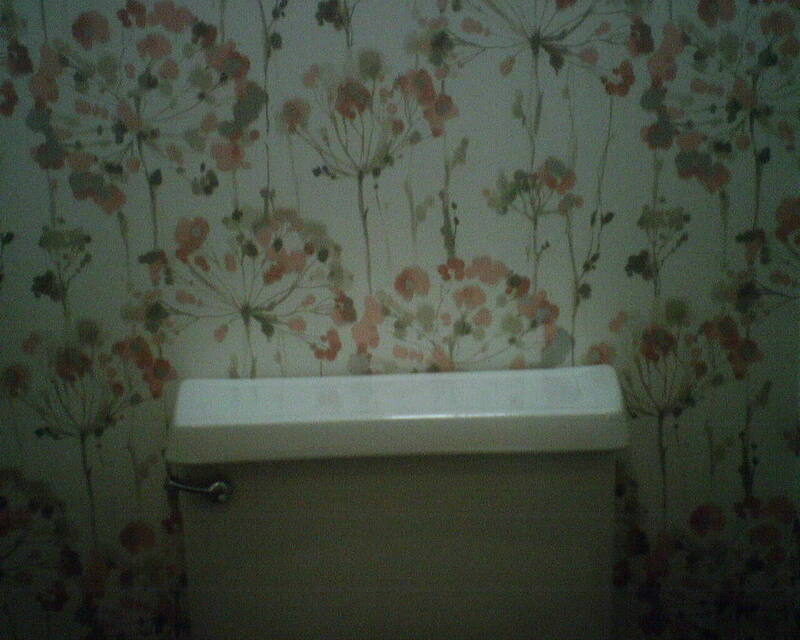 The homeowner’s selection was spot-on when she chose this soft floral pattern with an upward movement. 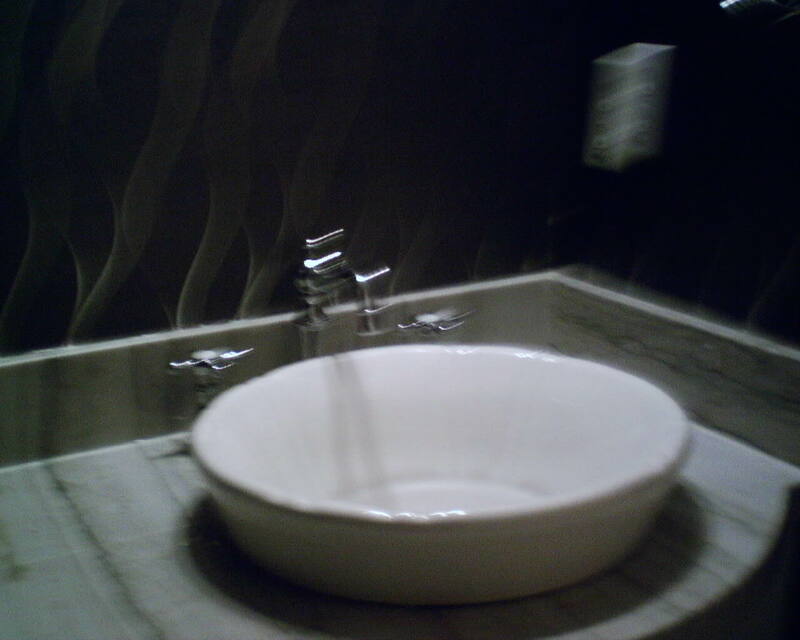 The color perfectly coordinates with the tile and countertop in the powder room, as well as with the paint colors in the adjoining entry hall and bedroom. 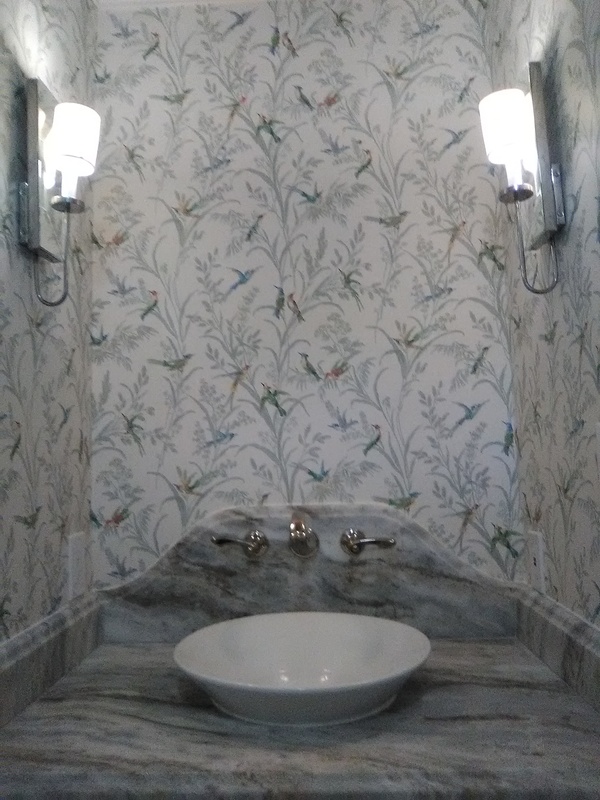 The wallpaper was carefully chosen, not just because of the color, but because this powder room-with-a-shower serves both the elderly father whose bedroom is next door, as well as guests, so the design couldn’t be too girly or frilly, while tying in with the country feel of this new home on the family farm. 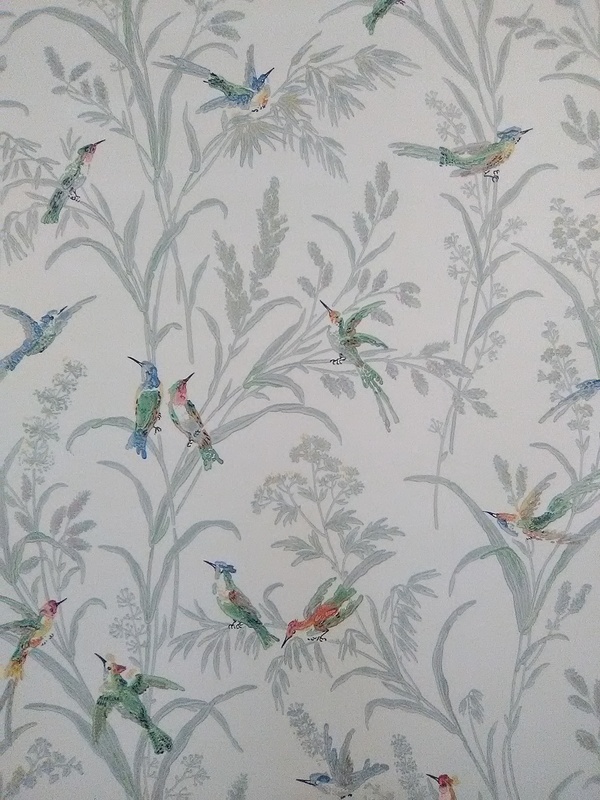 This wallpaper was bought at a discounted price from Dorota Hartwig at Southwestern Paint on Bissonnet near Kirby. (713) 520-6262 or dorotasouthwestern@hotmail.com. Discuss your project and make an appointment before heading over to see her. This new home is contemporary in style, and everything inside is all taupy grey brown charcoal cream white. 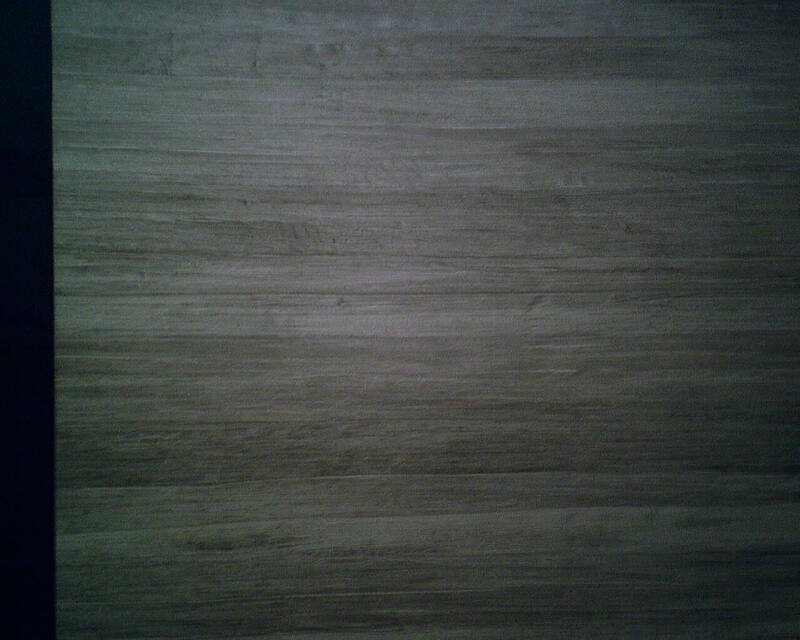 This subdued pattern, reminiscent of wood planks, in the same hues and shades, is the perfect match. 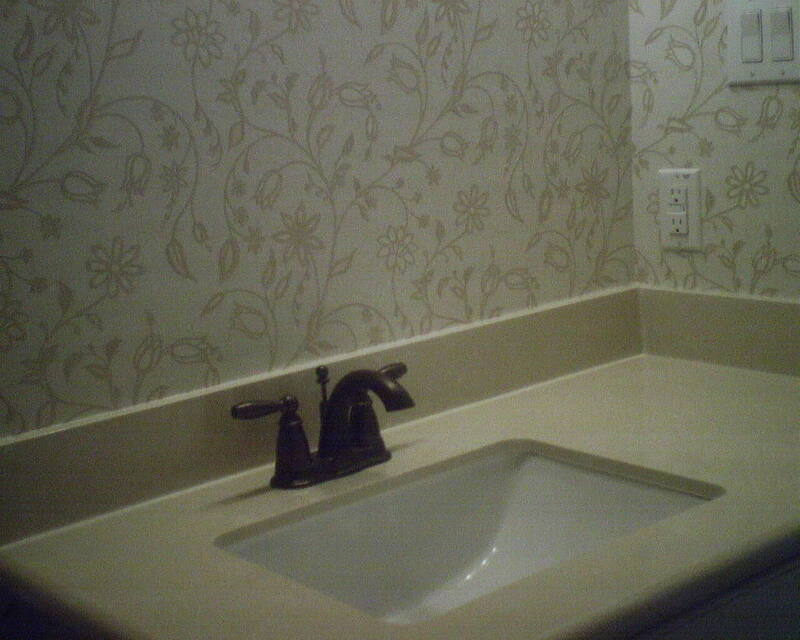 I’m not big on contemporary décor, but when the first strip of wallpaper went up, I was just blown away by how good it looked against the countertop and how well it coordinated with the rest of the house. 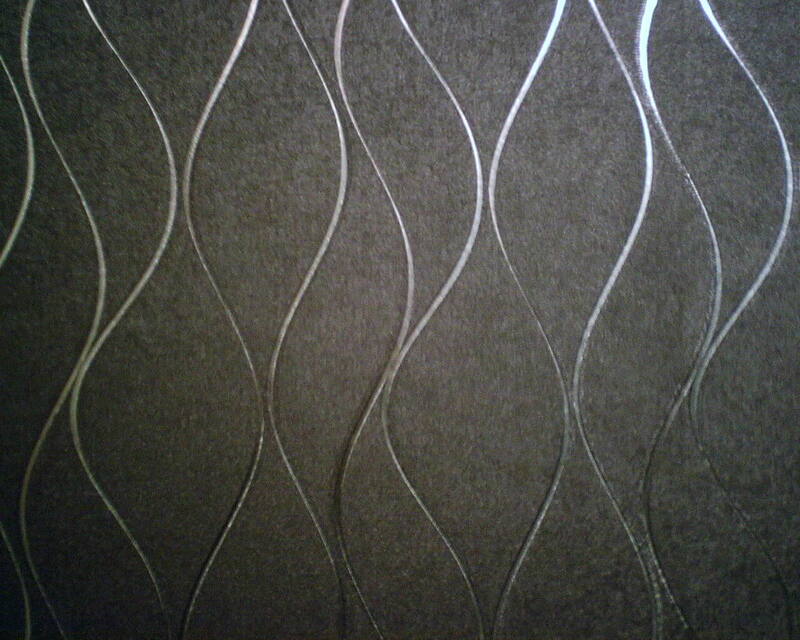 This is a textured heavy vinyl material, with no pattern match, so it looks a little like grasscloth on the wall. 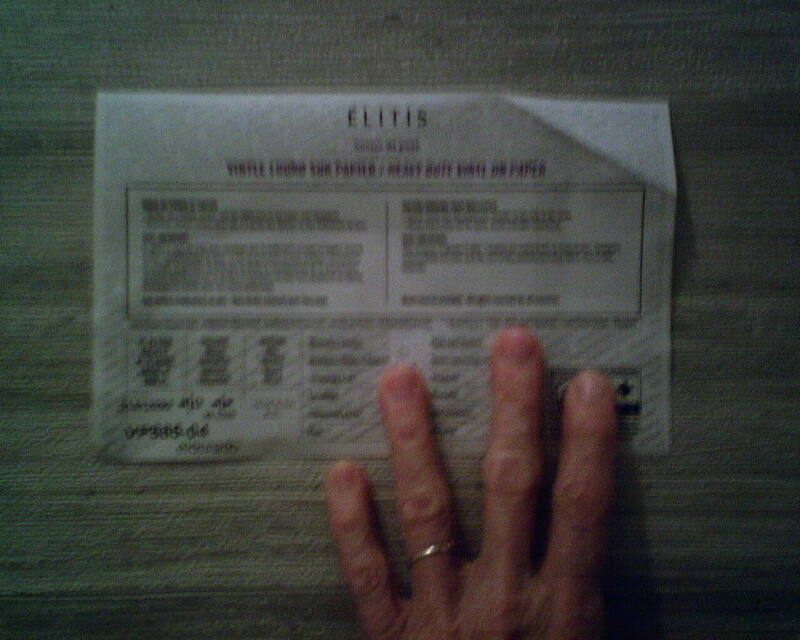 The manufacturer is Elitis, a French company. The interior designer is Neal Le Bouef, of L Design Group (do a Search on Google, HOUZZ, and Facebook), a lovely and fun person to work with, and who designs rooms that are crisp and sleek but still warm and welcoming and livable. This home is in Spring Branch (Houston).